Do you know how to stay connected to your purpose? Do you know your life’s purpose? Many of you do, I’m certain of that. But, if not, have you ever wondered what it would feel like to know it without question? 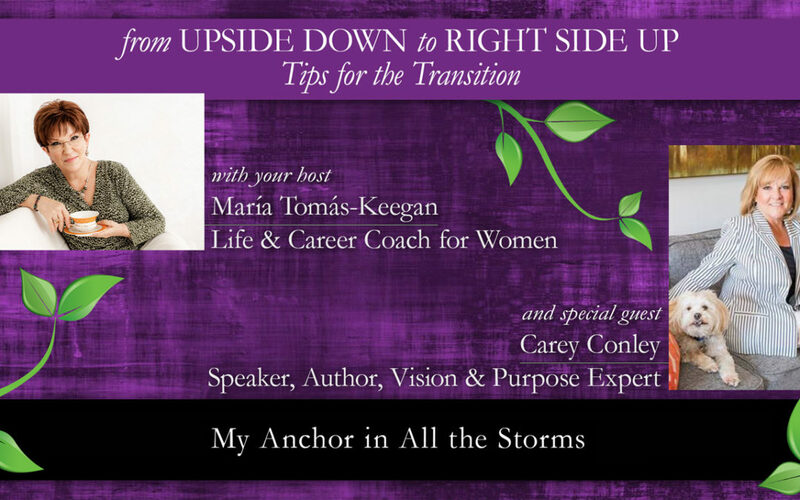 Carey Conley calls her purpose her anchor. She has been through more of life’s upside-down moments than anyone should have to bear. Her perspective on life, bouncing back and pursuing purpose will inspire you as much as it did me. Through building two businesses and raising two children, Carey had her share of upside-down moments with fear and doubt. Yet her vision was the foundation from which she bounced back each time. And then she lost her husband and son. This was the true test of whether the vision she held on to like an anchor would help her to survive. Carey will inspire you to think again about your vision. Is it big enough? Are you moving on purpose?